Choose from a complete line of Casino Quality Blackjack Layouts, including Standard Blackjack Layouts, Hit Soft 17 Blackjack Layouts, and Oversized Blackjack Layouts. 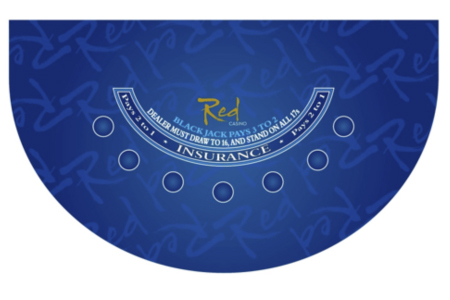 Regular Blackjack Layouts and Customized Blackjack Layouts with your Casino's design and color scheme are available. We offer two types of Casino Quality Blackjack Layouts: Synthetic Polyester Blend Blackjack Layouts and Billiard Cloth Blackjack Layouts. Our Synthetic Table Layouts are treated to be water repellent and flame retardant. Our standard Casino Quality Blackjack Layouts measure 75 inches x 62 inches, and they are available in blue, burgundy, and classic casino green (these Layouts are in stock. These layouts feature the regular Blackjack Layout design, with Blackjack paying 3 to 2 and the Dealer standing on all 17s. 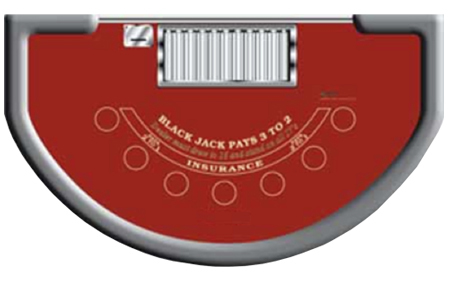 Home-Style Blackjack Layouts are made of high quality 2-millimeter thick felt. Perfect for home use, club use, or practice, each of our Felt Blackjack Layouts measures six feet wide by three feet high. 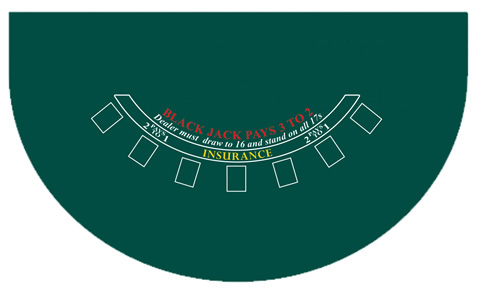 Our Home Style Blackjack Layouts come in a classic casino green color. These layouts feature the regular Blackjack Layout Design, with Blackjack paying 3 to 2 and the Dealer standing on all 17s. For additional information on any of our Blackjack Layouts, please contact us at 1-800-233-0828. You might also be interested on our other Casino Table Game Layouts, including Craps Layouts, Roulette Layouts, Poker Layouts, and more.